Snow White as the cocaine queen? Hansel and Gretel abducted by aliens? And since when is Red's granny into cosplay? Classic fairy tales are reimagined in this collection. Don't expect an innocent Cinderella or a sober Red Riding Hood. As for Pinocchio, what is it that grows when he lies? These short twisted fairy tales that had me laughing out loud at some parts, from Red Riding Hoods sexual role playing grandma, to a Colombian mob boss Snow White, stoner Hansel and Gretal, and drug dealing three little pigs; these stories range from hilarious to bizarre. At first I thought the narrators little girl type voice in the audiobook might irritate but it didn't at all. She did an excellent job and suited the stories well. She not only managed the various accents and genders well but also infused wry humour into the narration. This is a short retelling of a variety of fairy tales that will entertain and amuse. 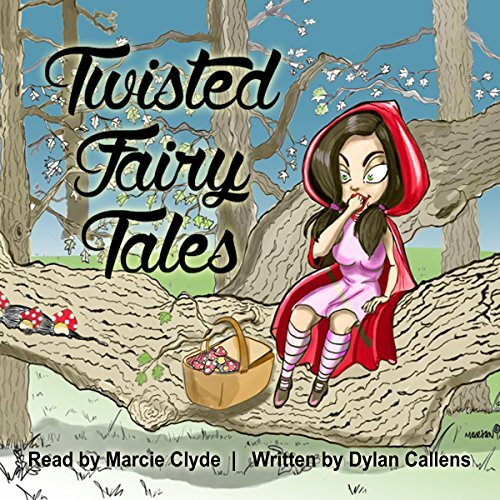 Though number one was my favorite, there are many more tales tackled in this short book.Not for the kiddies!lol I was impressed by the narration by Marcie Clyde.I was provided this book by the author,narrator or publisher. Interesting new takes on classic tales! Would you listen to Twisted Fairy Tales again? Why? Absolutely! It's a quick finish, and kept me interested the entire time. I finished it in one sitting and plan to listen again. I loved how unique these were and that they are written for adults. There are many different classics included, and I hope the author writes more like this! I got a good laugh out of each tale. I enjoyed the Big Bad Wolf story. Very interesting and creative! Not at all like the original and I loved it! Wish there was more to that. Who was the most memorable character of Twisted Fairy Tales and why? Pinocchio! I loved that it wasn't his nose that grew this time haha!! And the dark ending was a nice surprise! I really enjoyed Twisted Fairy Tales. It is 100% for adults so don't listen to it with kids in the car. The stories are dirty, hilarious and nothing is expected. They touch on drugs, violence, profanity and sexual topics. I laughed the most listening to Little Red Riding Hood's account of her very dirty grandma. I wish there was more! A reimagining of children's fairy tales. I typically love these, especially with adult themes. Unfortunately, these felt too rushed. They were also a bit heavy on drug references which simply isn't my taste. The narrator, Marcie Clyde was probably the biggest saving grace for this book. Her sweet innocent sounding voice was a perfect contrast to the adult themes and language in the stories. Unfortunately this is not a book that I can recommend. Deconstructing common fairy tales is not an easy task, yet Dylan Callens manages to remove morality out of them and presents them with a different perspective.The narrator's voice and performance was a perfect match. Provocative and humorous. Fan fiction at its best. Well done! (Three little pigs was my favorite :) ). Twisted fairy tales is extremely funny. If you are easily offended then you may not enjoy this book. But for those that are tired of typical fairytales, this is the book for you. It follows the basic storyline of a fairytale but then it is like a rollercoaster twist. There is no guessing how the tales will turn. Just buckle up and enjoy the ride. It is a super fast and fun way to escape. This was an entertaining book, but it is definitely for adults, as there is profanity and sexual content. I enjoy a good retelling of fairy tales - it spices up the original tale we've all heard countless times. This book was quite enjoyable and it had elements of humor and the bizarre. I listened to the Audible audio edition narrated by Marcie Clyde, and I think she was a good choice for the narrator of this story (though some of her pronunciations irked me a little). She has a very "cutesy" voice and it just adds to the humor of the stories when you hear someone that sounds like they could be a little girl telling these stories with the profanity and sexual scenes (if that makes sense). Overall, a good book. If you like dark retellings of fairy tales, you should check this one out.